LG ‘Signature Kitchen Suite’ makes its debut in European market. August. 31, 2018 07:30. by Jae-Hee Kim jetti@donga.com. LG Electronics will officially launch its ultra-premium built-in kitchen appliances brand "Signature Kitchen Suite" in the European market and expand its dominance in the European home appliances sector. 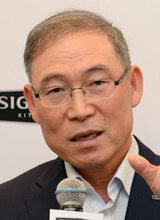 “We will increase our market share in Europe’s competitive built-in kitchen appliances market by equipping ourselves with innovative functions, design where the spirit of masters can be felt as well as distinguishing smart service,” said Song Dae-hyeon, chief of the H&A headquarters of LG Electronics, in Berlin on Thursday (local time). LG Electronics worked hard to enter into the European market, which can be seen in its efforts to prepare an exclusive brand room, which will exhibit the Signature Kitchen Suite at the outside garden of the exhibition hall at the Internationale Funkausstellung (commonly called IFA), scheduled to be opened on Friday. This implies that LG Electronics will compete with its quality as much as it is making its debut in the home country of traditional built-in brands such as Miele and Gaggenau. The reason why LG Electronics is betting life and death in launching Signature Kitchen Suite in Europe owes to the scope of the market. According to a market investment institution called Euro Monitor, the built-in market in Europe is worth some 18 billion U.S. dollars (some 20 trillion won), which enjoys the largest scale in the world. It takes up to 40 percent of the total global market. Moreover, there are many customers in Europe who desire to use space efficiently as the kitchen area is rather small in Europe.